The Dynamics GP Blogster: What does SQL Maintenance really do? When the Recompile option is selected in the SQL Maintenance window, GP forces the selected tables auto-stored procedures and triggers to recompile by executing the SQL Server sp_recompile statement. Update Statistics updates information about the distribution of key values for one or more statistics groups (collections) in the specified table or indexed view. If there is significant change in the key values in the index, rerun UPDATE STATISTICS on that index. If lots of data in an indexed column has been added, changed, or removed (that is, if the distribution of key values has changed), or the table has been truncated by using the TRUNCATE TABLE statement and then repopulated, use UPDATE STATISTICS. To see when the statistics were last updated, use the STATS_DATE function from SQL Server. Removes one or more table definitions and all data, indexes, triggers, constraints, and permission specifications for those tables. Drop table will not remove the associated table views or auto-stored procedures, hence, it is recommended to run the Drop Auto Procedure option in conjunction with this option. The Drop Table option executes SQL Server DROP TABLE statement. 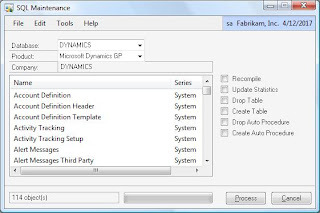 The Create Table option creates a Dynamics GP table (that has been dropped with the Drop Table option or dropped from SQL Server) with the structure defined in the DYNAMICS.DIC dictionary file. When this option is executed, GP will check for the table existence and drop if it already exists. In addition, all table auto procedures (zDP_) will be dropped and recreated and security granted to the DYNGRP role. This option will remove all selected tables auto stored procedures. The zDP_ procedures aid Dynamics GP in retrieving, saving, updating, and deleting records from a table. This option will create all selected tables auto stored procedures. If the procedures already exist, they are dropped and recreated. Developing for Dynamics GP - "What do the zDP auto-generated stored procedures do? ", by David Musgrave. Developing for Dynamics GP - "What is Column desSPRkmhBBCreh? ", by David Musgrave. Microsoft Developer's Network (MSDN) - You can always search SQL Server Books Online for all topics outlined in this article. Great Article, can I publish your entire blog? My gosh it's good reading! Much thanks for the kind words!Feel free to make any entries in your blog referring any article on this site. In fact, it's a very common practice among Dynamics GP bloggers. Mario, any idea what order these should be done in? I'm assuming if you drop and recreate the stored procs, you will want to recompile and update statistics AFTER doing so, but I could be wrong. Maybe GP knows what order to run them in regardless of the order they show on the screen, but the order they show on screen does not make sense.